Schuyler has chosen a new design to complement its flagship Quentel reference series. The new design comes as Schuyler Bible Publishers continues to expand its influence in the premium Bible world. Schuyler’s new design is unique, attractive and practical. It has been named the Treveris series after the distinguished British printer Peter Treveris (~1520). The Treveris setting is a single column paragraph Bible, which will begin with the King James Version, but will potentially extend to the NKJV, ESV, NASB and perhaps the NIV and NLT. Poetic sections and quotations have been ‘set off’ in a block verse- by-verse format (see below). The generous 10 point vintage semi-bold font with adequate spacing between letters, words and lines, has created a format that makes reading exciting! The ornamental drop caps produce an artful, attractive vintage style that appeals to many Bible readers. We hope to have our first copies in stock by the fall of 2019. To stay ‘in the loop’ about this new design – click here. Below are a few rough draft samples which may be slightly altered before publication – these are here to represent the basic form of this series. Here are some first impressions of this typesetting by Randy Brown. Poetry and quotations are block indented and versified as below. 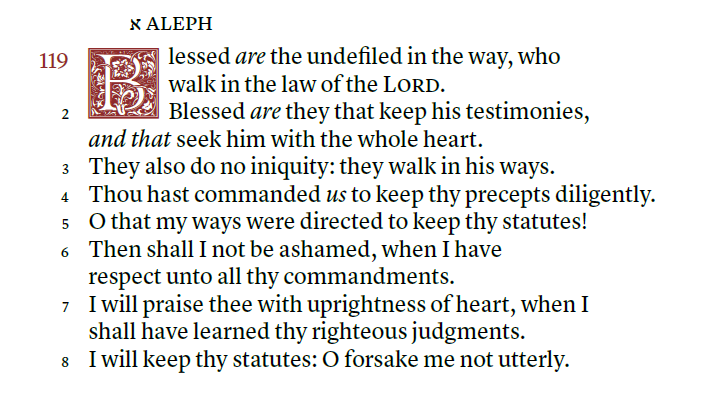 Psalms (above) is versified but not indented since the entire book is poetry. A unique aspect of the Treveris is that it sets off poetry. 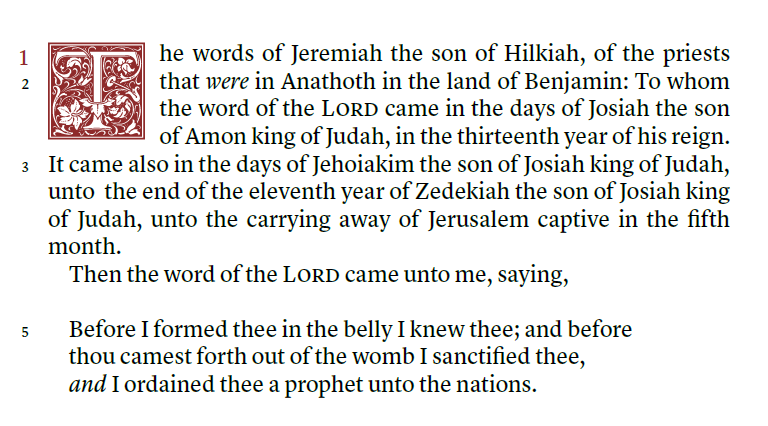 That is not common in the King James Version, in large measure due to the fact that most KJV Bibles are double column and versified. 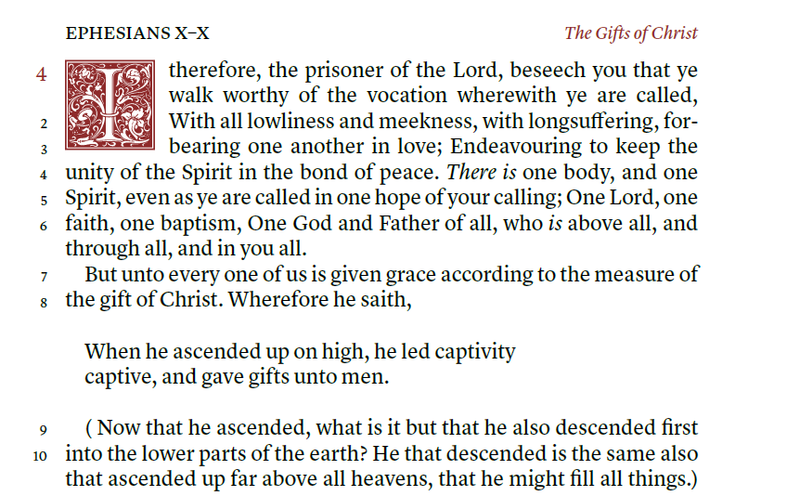 A portion of Ephesians below. Chapter numbers are clear and bold. Verse numbers in the margin. Poetry block indented. Inserted words in italics.